My pre-intermediate students are confused by all the different verb patterns. So the last two weeks I spent designing a mind map that would help them. It is in no way a comprehensive description of the grammar, but I feel quite happy about it. Looking for some rules I discovered that the pattern verb + to + verb is much more common than verb + verb-ing. 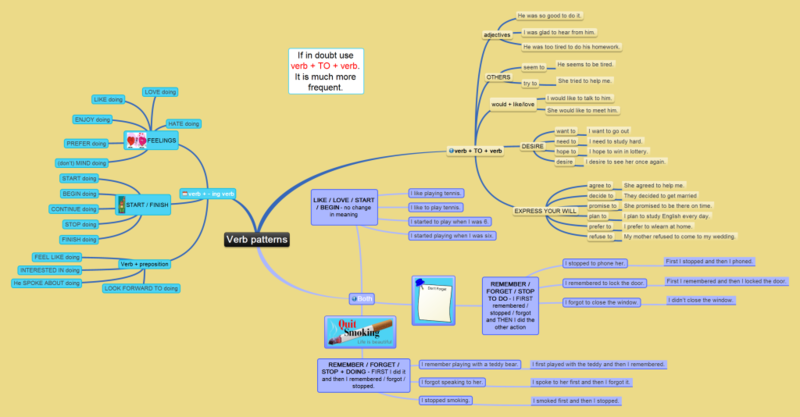 So my advice to my students is: “If in doubt, use TO + verb.” I hope this mind map will help you understand the verb patterns too. To practise the verb patterns you can try the following games. The first game is called Penalty Shootout. Your task is to choose the correct answer and then score a goal. To be able to play the game, you need to download the file and then open it in Acrobat Reader by Adobe. To practise the verb patterns you can play the following game. Its name is En Garde. Your task is to choose the correct answer and then stop the target as close to the centre as possible. Hopefully, you will be faster and more accurate then your opponent. The game is in Flash and will play only if you download the file and open it in Acrobat Reader by Adobe. Nice map but could you please explain what you mean by: He was so good to do it? Is it like, He was so good at it? it is good for teaching verb, can i share it..? I wanna say two words : excuse 4 share..
sir, i did not understand the above procedure.. will u please explain abot that mind mapping? Read the map from the top clockwise. No problem. It is here to be shared and used. I am glad that you like it. For example, I needed some help and he was so good to do it. It will be very helpful for my younger brother. Thanks. It ‘s very nice for me and my students. Thanks. First of all, thank you very much for your clues in learning English. I’ve understood (I hope I haven’t misunderstood)that we should use ”prefer + verb +ing” in ”feelings” but we should use ”prefer + to + verb” in ”willings”. could u tell me how to get mind map software?it’s interesting to design material. I use Maple mind which is free. However, there are many different programmes eg. iMindMap, Inspiration or MindMeister.